Hart Design provide a full design service from web design right through to logo design and branding. Symphony Showers is a New Zealand owned shower manufacturer based here in Auckland. The Symphony brand is one of several operating under the parent company Fibre Systems Ltd. Fibre Systems approached us to design a fresh brand identity for three brands operating under the Fibre Systems banner, as well as new website design for Symphony Shower Systems. Fibre Systems operate three brands to cater for different markets. Nouera Shower Systems comprises their premium shower range and provides the overarching brand under which two separate ranges, known as Symphony Shower Systems and Stellar Shower Systems, are marketed to specific sectors. The logo design brief was to create continuity across the three brands while at the same time respecting the hierarchy described above. Our approach was to create a contemporary logo design and was easily modified to allow for the three variations – and also cater for any new brands that may eventuate in future. To achieve this goal of versatility, the logo design must be simple, clean. We selected a modern sans-serif font and designed an icon to accompany the text. The icon design represents a shower head, naturally, and it has a regal feel to it. Together with the typeface used and the composition of the logo, the overall effect of the logo is certainly clean and crisp – just what you want to represent a shower manufacturer. Brand separation was provided by selecting two modern, punchy colours that look equally great online and in print. To pitch Nouera just above the others, this logo features the addition of a charcoal grey colour for the type while retaining the original lavender tone which both the Nouera and Stellar brands are already known for in the industry. Where the other two logos are simply one colour, the two-tone Nouera logo is very subtly elevated above the others. Brand continuity was provided by maintaining the font, icon and composition across all three logos. Did we mention versatile? The key to any good logo design is in its simplicity. This allows the logo to be easily replicated across all media from print to web to signage to embroidery, and of course in social media where a brand must be easily recognisable at very small sizes. Additionally, the branding exercise included both horizontal and vertical logo layouts to accommodate varying scenarios, including when the logos need to be seen together, for example on the Nouera letterhead design. Steve Keene and the team from Fibre Systems loved the results, “The logo designs have been well received, you guys have done a tremendous job. Everyone is now so excited about the new logos!” says Steve. Simplicity in design is a fundamental skill that often relies on an experienced eye – and this is exactly what you get from the team at Hart Design! 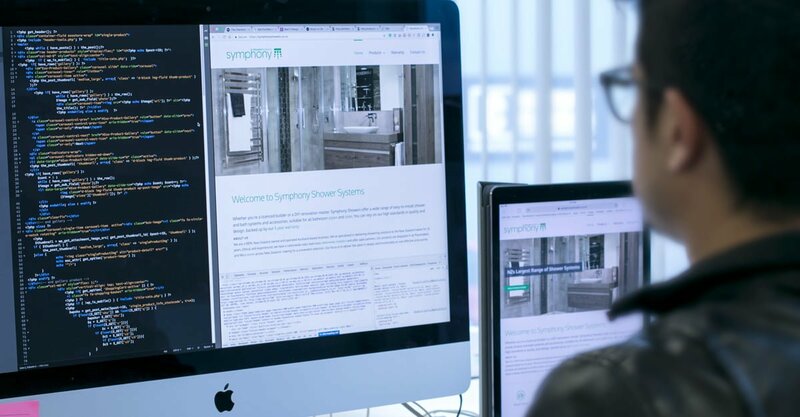 The new web design for Symphony Showers was primarily to be used as a resource for their customers looking for specifications and installation information for their full range of showers. The most important factor was a clear navigation structure that allowed users to quickly identify the size and configuration of shower they are looking for. And once located, the information and specifications for each unit must be clearly laid out for quick and easy reference. Hart Design has designed a simple, logical website navigation that allows users to find showers based on their type or size. No matter what direction a user is starting from, whether they have a particular style in mind or they are approaching their bathroom renovation with size as the key requirement, the user will find the Symphony Shower that’s right for them. The sitemap covers plenty of ground so to make browsing the website easy and successful we created an advanced menu system that helps users find what they need, quickly. All set against a clean, white background, the website is designed with ease-of-use as its main goal. There are plenty of internal links that connect relevant content. Built in WordPress, with a little tutorial for Fibre Systems, they are able to maintain the website internally and add new content to the site as it comes to hand. Fibre Systems now have a valuable resource for all of their target audiences – homeowners, renovators, builders and of course their distributors who sell the Symphony range to end users across the country. 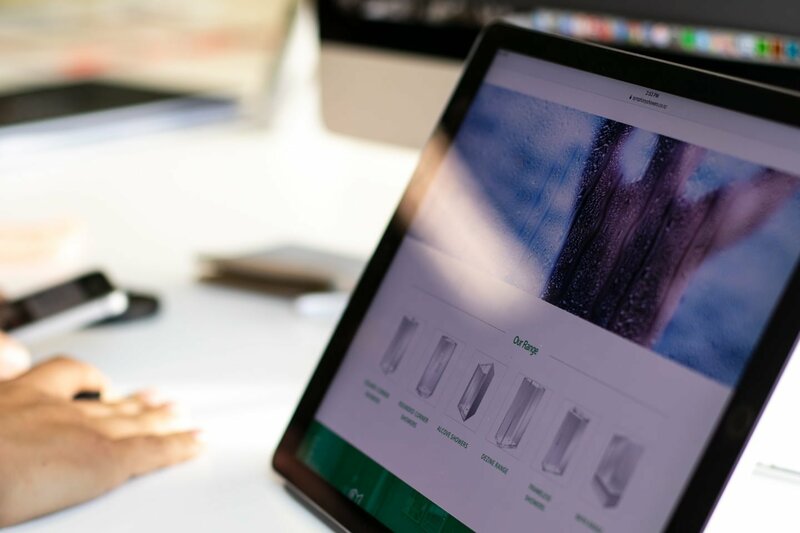 Traditionally dealing with only their distributors, this new website design is the foundation for all future marketing initiatives as the Symphony Shower Systems brand plans to engage face-to-face with the general public. Watch for the website to grow over time as Symphony connects with their end users through social media and other online/offline marketing techniques. And of course, Hart Design is right here to support the efforts of their internal marketing team. Need a new brand identity and a website? Our creative team will have your online/offline brand singing in perfect harmony.